February is a month of big games, lots of love, spring festivals and a surprising number of death metal performances. We’re certainly not complaining. Where else can you go from rocking Black Sabbath one night to having a romantic Valentine’s dinner to laughing at Adam Sandler the next? Before all that, you can bet on the Big Game and after you can celebrate the Year of the Monkey. We’ve really got something for everyone this month, and even an extra day to do it all. So let’s get started. We’ve been waiting all year for the epic showdown between that one team we don’t know yet and the other team we also don’t know yet. We’ll try to remember to update this after the championships. While we decide how much we want to bet on the coin toss (come on, tails! ), you can figure out where you want to watch the action when you’re in Vegas. How football was meant to be enjoyed. Photo courtesy of Tao. Food and football go hand in hand, so enjoy the best of both at Tao for only $75 general admission with open bar from 2 – 5 p.m. or $135 for all that and an amazing buffet featuring spicy BBQ spare ribs, salt and pepper shrimp, orange chicken and pork belly fried rice. Or, if you’d prefer a buffet full of spicy scarpariello chicken wings, grilled baby lamb chops, Kobe meatballs, endless shrimp cocktail bowl and more, head to the LAVO Bowl at LAVO in Palazzo for $85 – $145 from 2 p.m. – 5 p.m.
Just replace the Spice Girls impersonators with football. Photo courtesy of The Sayers Club. 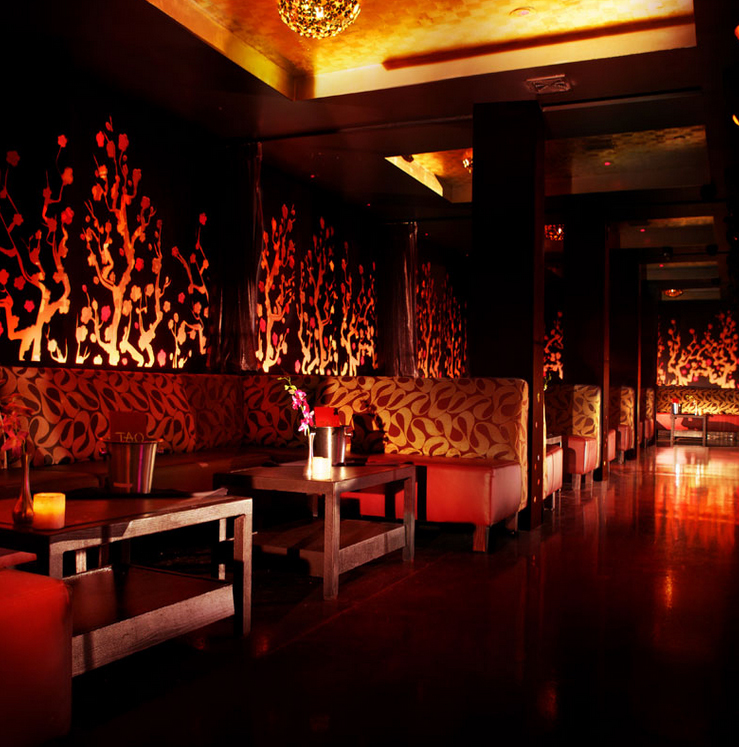 Another fabulous option is watching the game at The Sayers Club at SLS. For $60 per person you can enjoy an open bar from noon – 5 p.m, and with VIP packages you can also get amazing pizza from 800 Degrees Neapolitan Pizzeria nearby. You’re also just a short jaunt across the casino from the sports book and Umami Burger and Beer Garden, in case you want to place some bets. This place was made for football. 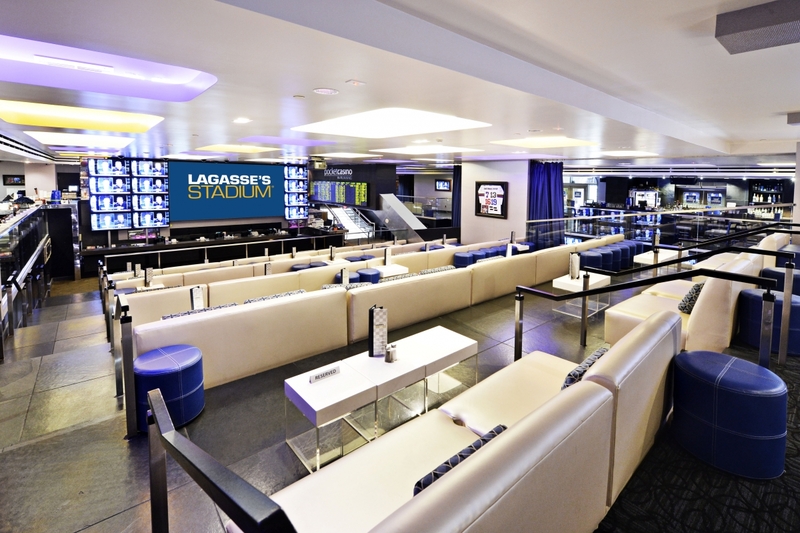 Photo courtesy of Lagasse’s Stadium. One of the finest sports books in town, Legasse’s Stadium has more than 100 TVs on which to watch the game as well as amazing food from Emeril Lagassee himself. Special game-day menu includes a 32-ounce Tomahawk ribeye with mashed potatoes for $82 (add grilled shrimp for $10 more); chilled Alaskan king crab legs with butter for $65 per pound; and seared Maine sea scallops on polenta for $44. There will also be pitchers of Bud Light for $15 and buckets for $25. That’s a pretty hard deal to beat on such a big day. Be sure to check out our Big Game Page for more spots to spend your day cheering for your favorite – or just least-hated – team. 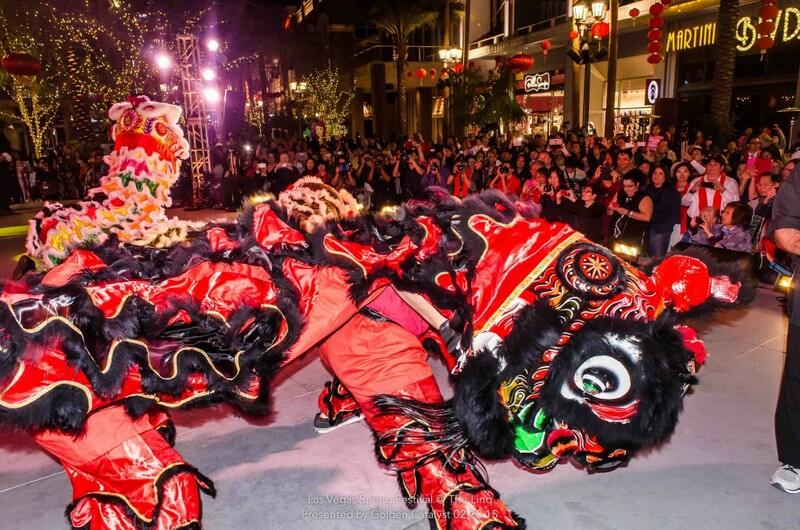 Lion Dance at the LINQ Promenade 2015. Photo courtesy of Chinese New Year in the Desert. Also known as “Spring Festival” in China, “Tet New Year” in Vietnam and “Seol-lal” in Korea, Chinese New Year is a vibrant celebration full of shows, performances and more. 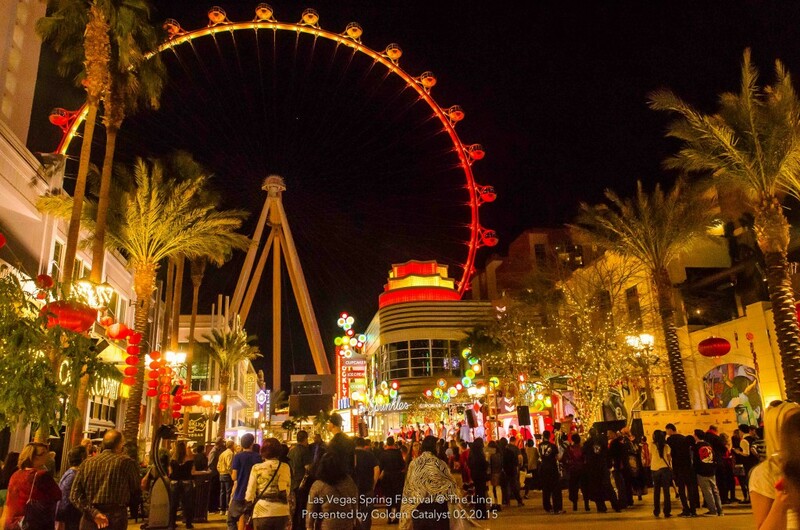 As the year of the monkey dawns, here are some of the places to celebrate Chinese New Year in Las Vegas. 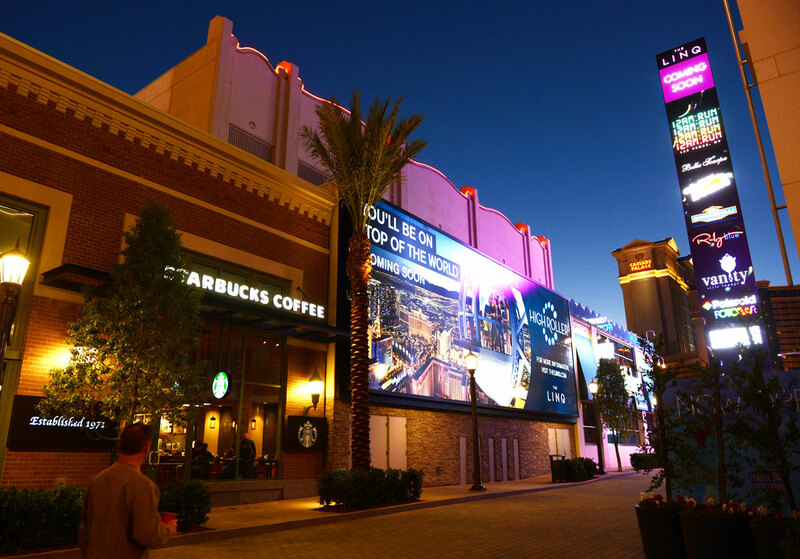 The beautiful LINQ Promenade will come alive with entertainment and expression. Opening ceremonies featuring a ribbon cutting, live authentic dragon dance, an eye painting ceremony and performers dressed in elaborate costumes on Tuesday, Feb. 9. Hunan Provincial Song & Dance Troupe, a popular theater troupe showcasing specialty ethnic and folk artist performances daily from Feb. 9 – 14.
International culinary competitions, live cooking demonstrations and food art carvings by Caesars Entertainment and Le Cordon Bleu College of Culinary Arts Las Vegas chefs including ice sculpting and fruit carving by Le Cordon Bleu on Wednesday, Feb. 10. Various Caesars Entertainment chefs will also perform a noodle pulling and suckling pig demo on Friday, Feb. 12. Dance-4-a-Cause thousands of local Zumba®, Hot Hula Fitness, U-Jam Fitness®, and MixxedFit® participants will gather to dance. Live DJ and entertainment on Saturday, Feb. 13. Participants are asked to bring chapter books (Kindergarten-12th grade) to benefit Somerset Academy and Spread the Word Nevada. The witty and charming Tsai Chin is a pop and folk singer from Taiwan. Singing in both Mandarin and Taiwanese, she’s bringing her hits like “The Forgotten Time,” “Just Like Your Tenderness” and “The Last Night” to the Colosseum at Caesars Palace. Tickets range from $58 to $100 and can be purchased directly from the Colosseum. 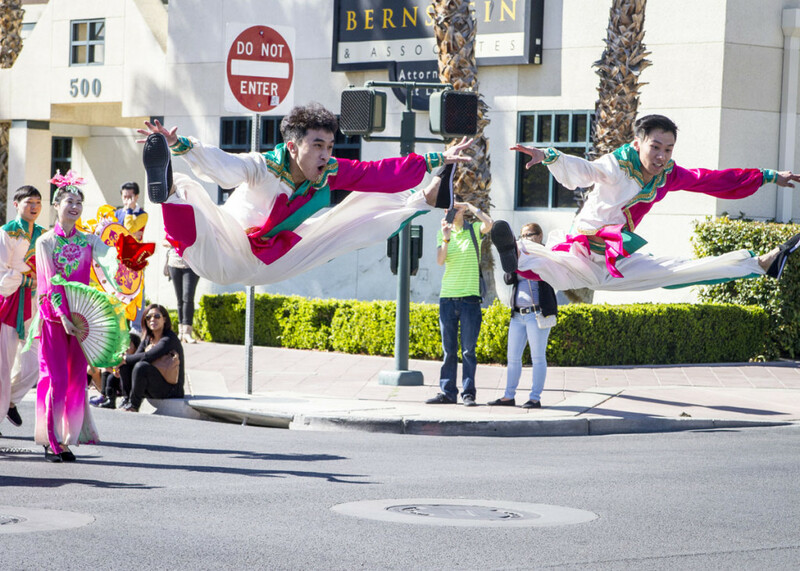 Performers at the 2015 Las Vegas Spring Festival Parade. Photo courtesy of Chinese New Year in the Desert. Extravagant floats and amazing performers will parade down Fremont Street celebrating the Asian community in Las Vegas. The parade will culminate at Downtown Container Park where the after party will be held for parade participants and viewers. This even is open to all ages. One more of the 2015 Las Vegas Spring Festival. Photo courtesy of Chinese New Year in the Desert. It’s the time for love and roses and hearts and chocolate and all that fun stuff that happens in Vegas, but hopefully doesn’t stay here. In this city you’ll be able to find a sweetheart of a deal at just about any restaurant you pick. So we wanted to give you some options beyond the typical dinner and drinks. Since it’s a part of the Chinese New Year celebration, we decided to put this one first. Plus, it just sounds like a lot of fun. 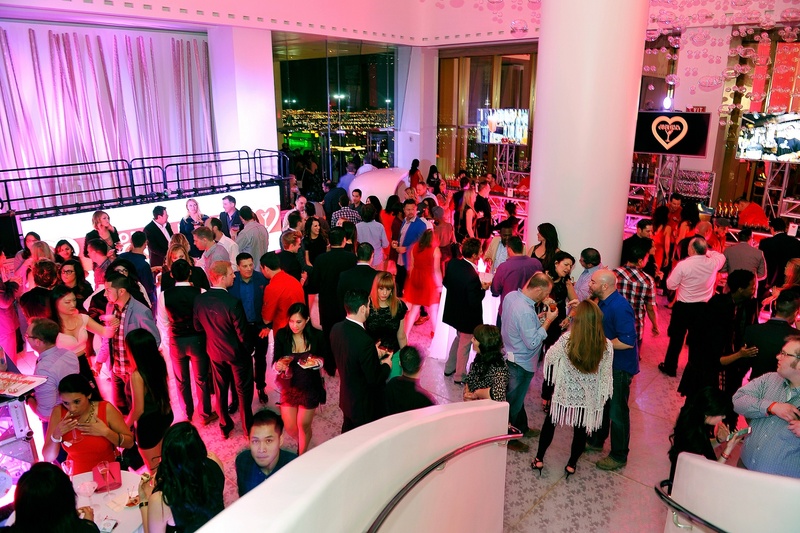 The LINQ Promenade is hosting a mass wedding ceremony where multiple couples will be married at the same time on Valentine’s Day, officiated by a classic Elvis impersonator – who else would officiate in Vegas? Guests appear at For The Love Of Cocktails’ Grand Gala at the Delano Las Vegas at the Mandalay Bay Resort and Casino on Friday, Feb. 13, 2015, in Las Vegas. Photo courtesy of David Becker. We love our cocktails in Vegas. And with some of the best mixologists in the world, we take them pretty seriously. On Feb. 12, Skyfall Lounge will host “For the Love of Cocktails,” a gala event with more than two dozen specialty cocktails as well as gourmet tastings and entertainment. The pre-gala reception starts at 5 p.m. with the gala beginning at Skyfall at 7:30. Tickets are $150. If you love cocktails, cocktail culture, mixology, or just drinking in beautiful Las Vegas bars, this is the event you must hit up this February. A portion of the proceeds from ticket sales will benefit the Helen David Relief Fund for Bartenders Affected by Breast Cancer. 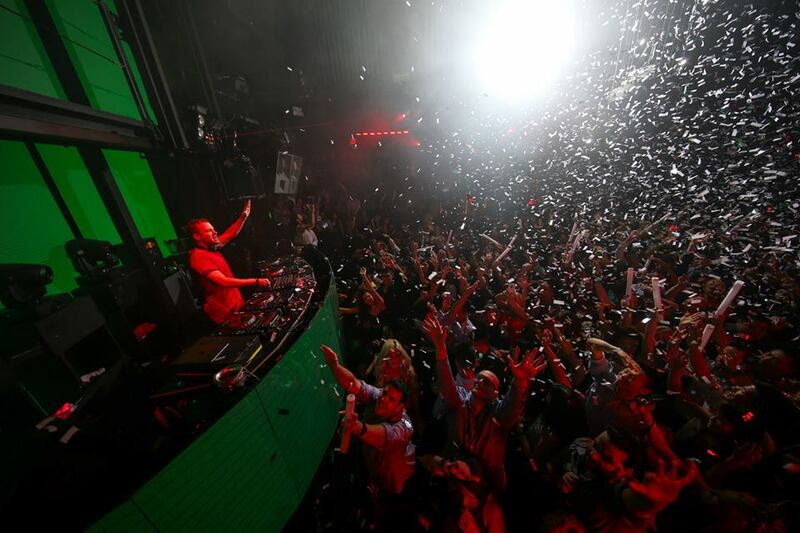 Dash Berlin at Marquee. Photo courtesy of Marquee Nightclub. It’s hard to believe we’re already halfway to EDC 2016. It seems like just yesterday we were drenched in sweat watching fireballs shoot into the sky while Krewella kicked it on stage. Despite having like six more months to go, we can still bump like it’s already June. From 11 a.m. to sunset, Marquee’s Dayclub Dome will drop over the pool area and we’ll be treated to an amazing list of performers. Marquee will also have local DJs including: Brett Rubin, Crespo, Kiddo, Lema, Lisa Pittman, Mike Attack and Paul Ahi. With all this love and celebration, you might be looking to laugh. Maybe you’re laughing with someone you love, and maybe you’re laughing at the fact that you’re all alone. It’s cool. We’ve all been there. Here’s some comedy to take your mind off it. Photo courtesy of David Alan Grier. 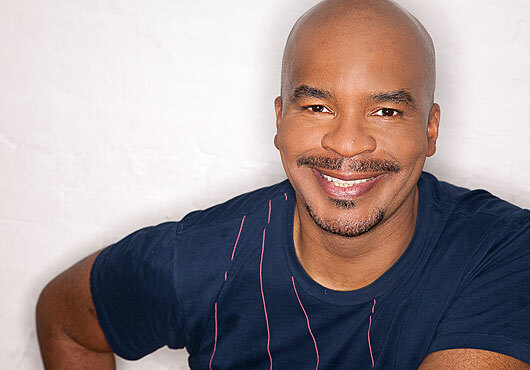 David Allen Grier is one of the brilliant minds behind “In Living Color” and Tommy Davidson is the star of “Black Dynamite.” They’ve both made waves in stand-up for years and now they’re together at Treasure Island for one night only. You might know him better as Tater Salad, or as the guy from Redneck Comedy Tour that wasn’t Larry the Cable Guy, Jeff Foxworthy or the other one. But Ron White has been solidifying his comedy name for years with hilarious stand up routines. He’ll be at the Mirage for two nights. They were all on “Saturday Night Live” at one point or another. Some had a better stint there than the others. We still lament the loss of Norm MacDonald on Weekend Update. But now they’re together on stage at the Joint at Hard Rock Hotel and Casino for two nights of hilarity courtesy of Netflix. Sandler and Schneider are both fresh off of Sandler’s “Ridiculous 6” for Netflix, and Norm MacDonald was probably doing something too. If you want to laugh, and have a girlfriend who’s understanding enough to let you take her to see these guys on Valentine’s Day, then this is a show you can’t miss. Ray Romano is famous for being loved by everybody. David Spade has more sarcastic wit than our favorite grandma when she’s been hitting the schnapps. Together they give an amazing performance full of hilarity and, knowing these two, probably just the right amount of dirty. You don’t have to be a fan to enjoy this performance, but let’s be real, with everything they’ve done from TV to films, how could you not be by now? Jay Leno, seen here trying to teach a bear to eat people. Good plan, Jay. Photo courtesy of Jay Leno. Jay Leno was once on TV every night hosting “The Tonight Show.” Then he was off TV, then earlier on TV, then back on TV at the other time, then we got really confused and now we’re just glad he’s here in person. Back once again to wow the Mirage, Jay Leno will deliver his perfected blend of humor and commentary. Landing much higher than the D List these days, Kathy Griffin has amassed a dedicated following thanks to her unapologetic approach and willingness to laugh at herself. Her stand-up has earned her critical acclaim and a wide fan base, all of whom will surely be out in force for her at the Mirage. Like we said at the beginning, there are some incredibly and surprisingly badass shows coming to Las Vegas in February. We’re not going to waste any time. Let’s get to the metal. 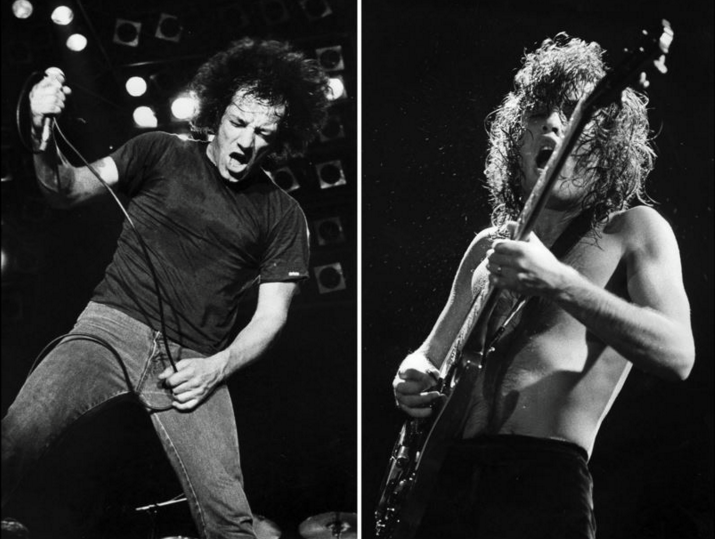 The intensity of AC/DC. Photo courtesy of AC/DC. It’s may be a long way to the top if you wanna rock ‘n’ roll, but it’s an easy trip to the MGM Grand to salute AC/DC. The hard rockers from Australia who defined a screeching sound and made dressing like a schoolboy somehow even creepier will turn the stage into a highway to hell with their dirty deeds. Let’s face it, if you can’t already hear the intro to “Thunderstruck” playing in your head right now then you will not shoot to thrill. We want blood. We’re pretty sad that there’s a generation of people out there who only know Ozzy Osbourne from reality TV. But long before he was throwing hams at people he was rocking their socks off as the frontman for Black Sabbath. Together again for what we hope won’t actually be the end, the classic rockers of death metal will bite the head off Mandalay Bay the night before Valentine’s Day. If you’re expecting anything other than awesome, such as staged arguments or any other reality TV nonsense, you’re on a crazy train. Rascal Flatts performing on the first night of their residency at the The Joint at the Hard Rock Hotel and Casino on Feb. 25, 2015 in Las Vegas, Nevada. Photo courtesy of Rascal Flatts. Taking a break from the hard rock for a moment, Rascal Flatts is coming to the Joint with an extended residency, the first country act to do so. If it were anyone else we might have a problem with that, but Rascal Flatts have proven their cred with multiple platinum albums and millions upon millions of tickets sold. 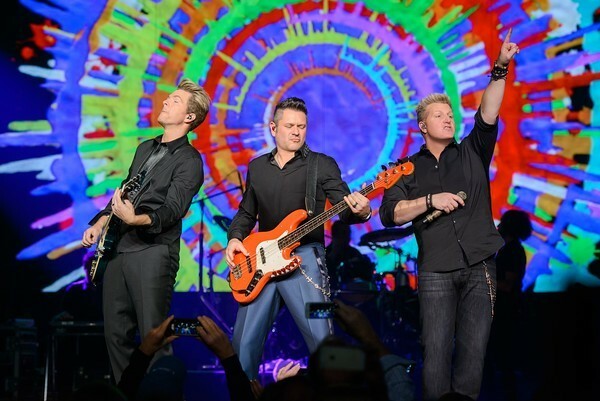 “Rascal Flatts Rhythm & Roots,” will appear for nine shows throughout February and early March. Dave Mustaine, the guy who was too metal for Metallica, for Megadeth in the ‘80s and quickly became one of the thrashiest thrashers of thrash metal. Shredding guitar licks and loud vocals make Megadeth one of the best hard rock bands ever. You could make a month out of hard rockery with this show. Send them to the Iron Maiden. 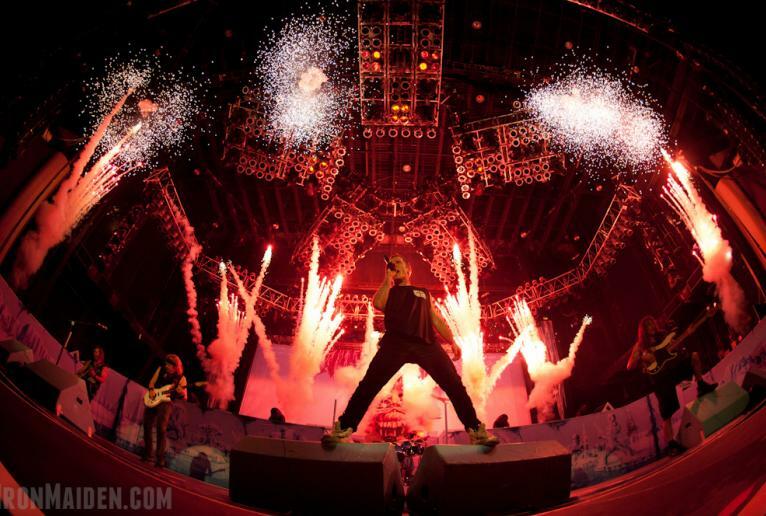 Photo courtesy of Iron Maiden. Known for their death metal styling and some of the most disturbingly awesome album covers ever, Iron Maiden have a long, strong tradition of rocking harder and darker than the competition. Throughout their nearly 40-year career they’ve released more than a dozen albums, each more devilish than the last. Now they’re here to turn up the heat at Mandalay Bay. So none of that tickled your fancy, or you’re just scrolling because you want to read everything. Thank you for that. You’re very sweet. Here’s what else is going on this month that you might be into. We love our UFC in Las Vegas. See all the action at the MGM Grand. Who can’t relate to the story two cosplayers trying to meet their comic book idol? The play “Geek!” takes that tale to the stage at Onyx Theater as the darkness behind cons is explored and the true face behind the masks emerges. Some mature language is included. The pretty Pahrump Balloon Festival. Photo courtesy of Pahrump Valley Chamber of Commerce. 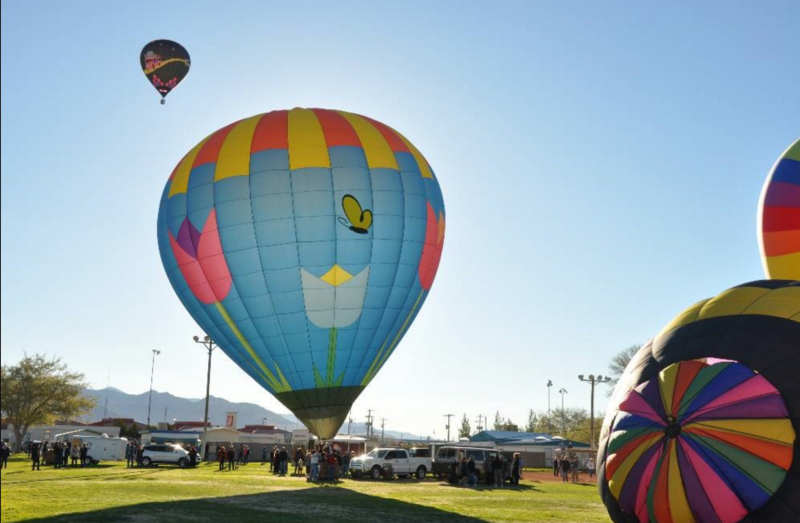 If punches to the face and faces painted like game characters aren’t your thing, the beautiful Pahrump Balloon Festival returns to the sky with gorgeous hot air balloons and much more. Leap Day isn’t just for that one friend who was born on Feb. 29 and who you constantly tease about only being 6 years old. It’s also for anyone what wants to get an extra day to enjoy everything Las Vegas has to offer. Check out our Vegas shows page to find something special to do on this special day.